A few months ago, necessity and inspiration smacked me in the face. It’s nice when those things occur simultaneously, or nearly so. 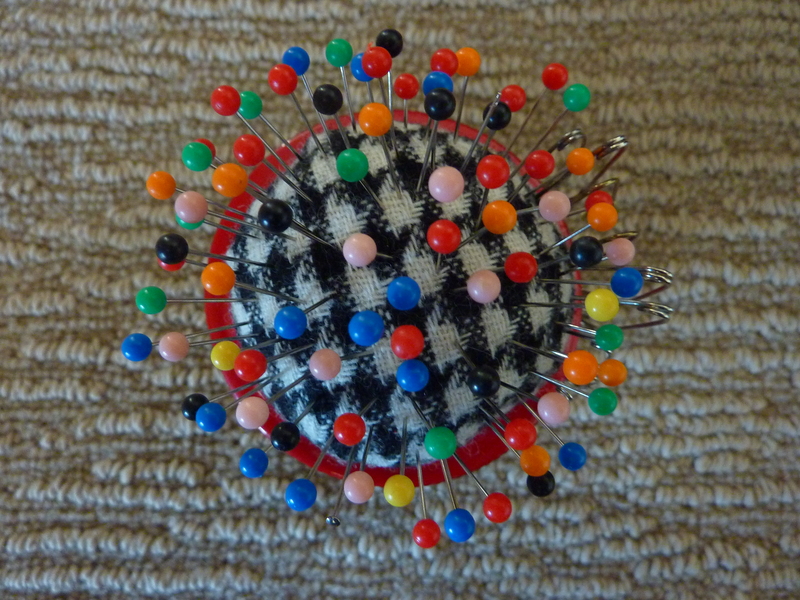 Necessity: I needed a pincushion. Pins don’t like “just hanging out” in ziplock baggies. 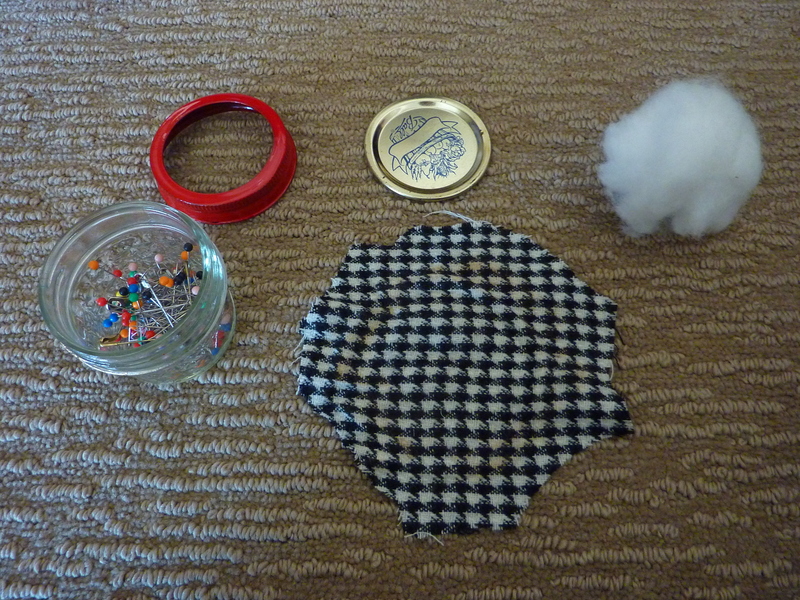 Inspiration: I had a teeny-tiny mason jar and cute houndstooth fabric. A match made in heaven? Probably not, but cute nonetheless. So I created this cute little guy and stabbed my pins into it. We lived happily like this for a good long while. But then I got sick of the slightly rusted canning ring and went and spray painted it red. 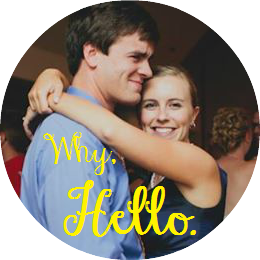 Here’s how I created it the second time. The supplies needed are pretty self explanatory but are pictured here in the hopes that I might trick you into thinking that this a “real” tutorial and that I’m a “real” blogger. Is it working? I do realize that if I have to ask, the answer is “no.” I’ll learn someday. 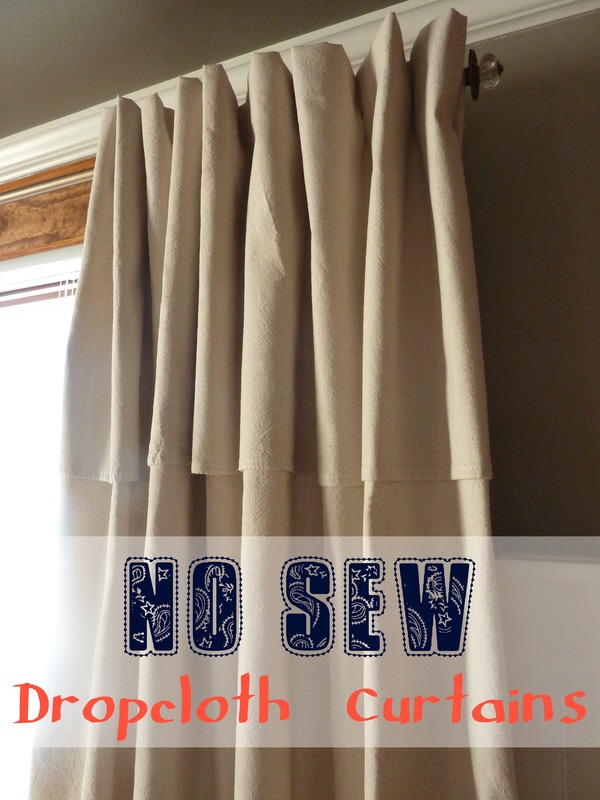 As for the “tutorial” part of this post: you kind of just jam the small bit of fluff up in the round piece of fabric and shove it all into the canning ring, wedging it in there very tightly with the canning lid. 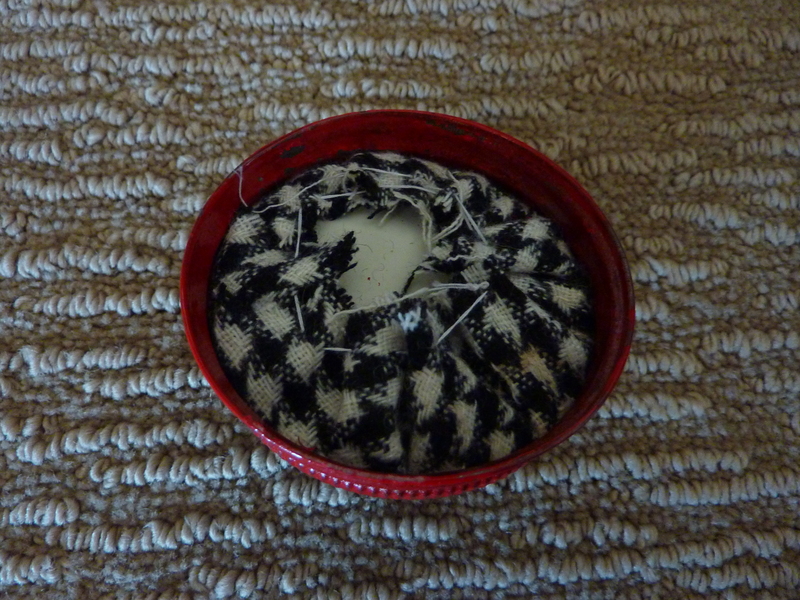 I then went the extra mile and hand stitched the round bit of fabric so that it wouldn’t hang down into the jar. My needles were very conveniently located for this project since they had been stuck into version 1.0, so I didn’t have to work very hard to complete this step. If I’d needed to reach for them, or, God forbid, stand up and go find the needles, this step very well may not have happened. 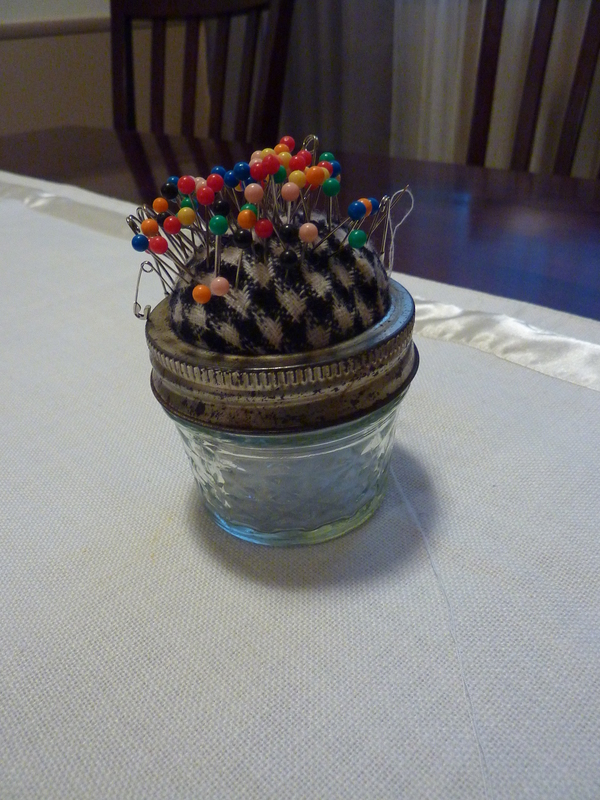 And then, once again, I stabbed all of the pins into the fluff after screwing the whole contraption back onto it’s mason jar bottom. If you were wondering where all of the white pins are (which I’m sure you were), I can answer that–they made their way into my brooch bouquet for our wedding, masquerading as pearl pins. I’ll let them stay there indefinitely, I think. I have no plans of yet to disassemble that beast. And here’s a fancy overhead picture for your pleasure. I’m not normally one to make such a big deal over purely functional objects, but this blog and my recent spray paint addiction have gotten the best of me. It’s the fumes, I think. The spray paint fumes, not the blog fumes. It would certainly be strange if my blog started emanating a scent. And since I’m over-explaining things altogether too much, I’m just going to end this here. 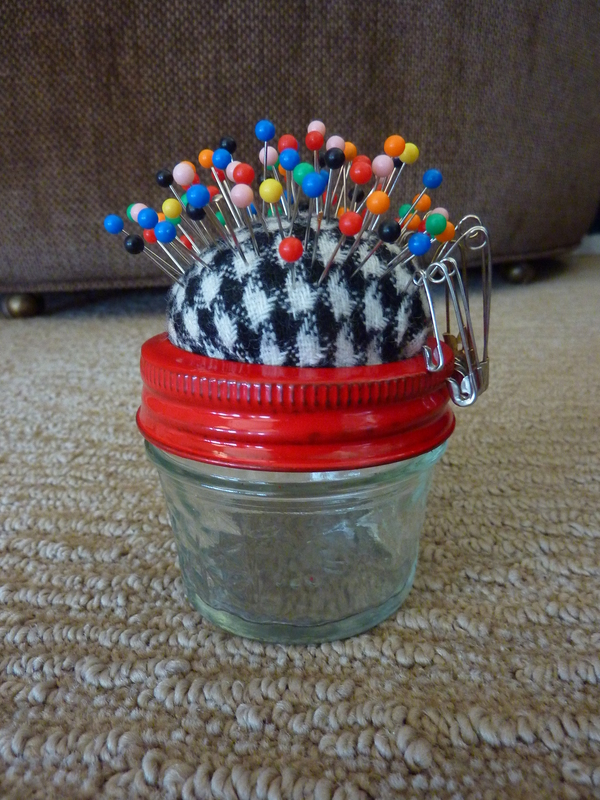 Categories: DIY | Tags: canning ring, houndstooth, Mason jar, needles, pincushion, pins, sewing, spray paint | Permalink. Cute! Not something this girl needs, but I like the idea of using a mason jar!